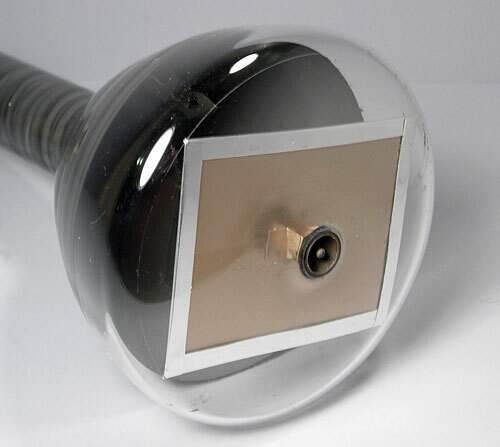 The monoscope was a variation on the familiar cathode ray tube design in which a conductive target (a metal plate) was used in place of the normal phosphor coating. An image or pattern was printed on this metal plate, as can be seen in some of the photographs below. As this pattern was scanned by the electron beam, a current flowed from the cathode through the target which varied according to the darkness of the image. This current formed a video signal that could be displayed on a standard monitor, or transmitted to a television receiver. The primary application for the monoscope was to generate test signals that could be used for equipment adjustments and maintenance. In the early days of TV, these test patterns (accompanied by an audio tone) were broadcast during time periods when live programming was not available. These tubes could be ordered with either a standard pattern, or a custom pattern which generally included the station's call sign and unique graphic designs. 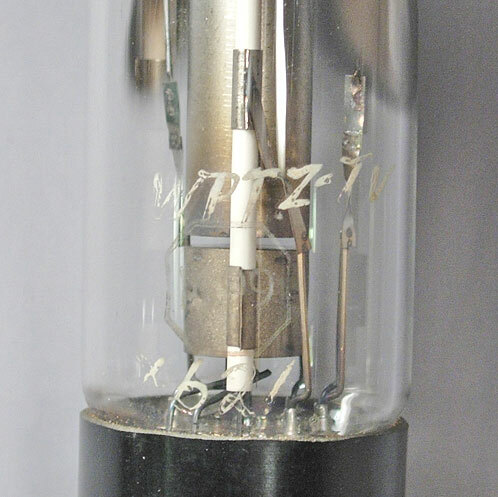 The RCA type 1699 tube shown in the previous two photographs was used by station WPTZ-TV in Philadelphia. The test pattern inside features the Westinghouse logo in the center and a picture of the transmitter building and antenna tower. Westinghouse owned WPTZ from 1952 to 1956, so this tube would have been from that period. Note the inscription on the neck of the tube. The 1699 is about 12 inches long, and 5 inches in diameter. It was introduced in 1939. Shown above is the actual test pattern that was generated by this tube, as seen in an old photograph that was taken of a TV screen. Shown above is the neck of another 1699 from WPTZ when it was owned by Philco (prior to 1952). The test pattern inside does not show the WPTZ call letters, it only shows the words "Philco Television". In this case, the word "Philco" was inscribed on the neck. 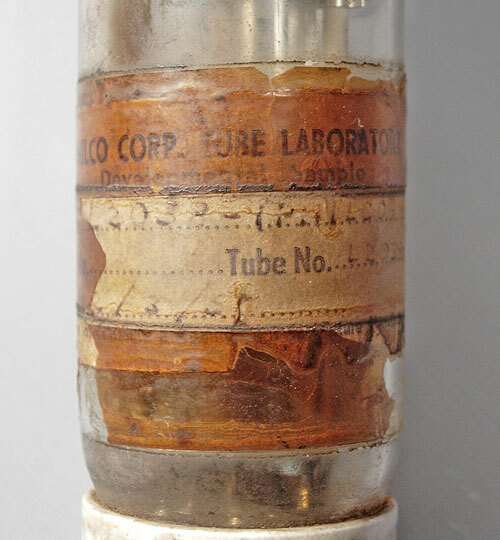 This tube is a developmental monoscope tube that was made in the Philco tube laboratory in 1951, according to the paper label around the neck of the tube. Presumably, it is functionally equivalent to the RCA 1699. This tube was not painted, so it is easy to see the test pattern on the target (though it is not especially easy to photograph). 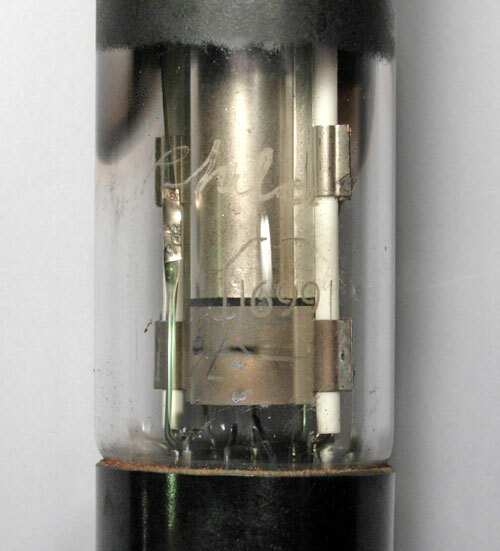 Since Philco was already buying monoscopes from RCA, it is not clear why they built this tube. This view of the Philco monoscope shows the rectangular metal target and the external electrical connection for it. The tube shown here is an monoscope that was made in the early 1940's. An article at the Early Television Foundation website suggests this tube was made for use by the American Television Institute as part of television-related training courses. It may actually be one that was made by students in one of their courses, which would certainly explain its crude construction and appearance. 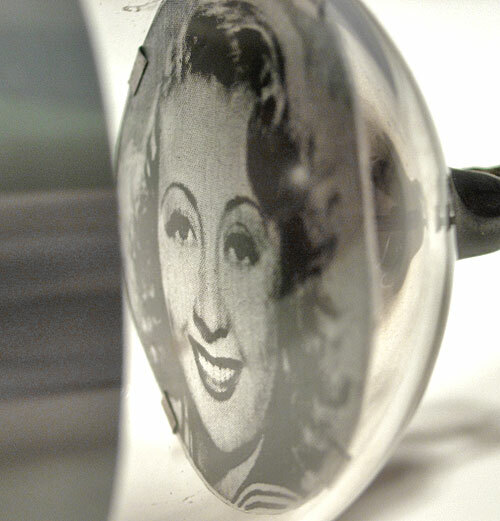 The image in this tube is that of actress Joan Blondell. This tube is about 11 inches long, and 2 inches in diameter.